After the great success of COSMO-RS (A. Klamt, COSMOLogic), similar models were developed by various research groups. DDBSP contains implementations of COSMO-RS(Ol) and COSMO-SAC that can be used for the estimation of different types of phase equilibria and excess properties. COSMO-RS and similar models derive the residual contribution to the activity coefficient from shielding charge density missfit interactions between contacting surface segments of the molecules. The different shielding charge densities are depicted by different colors for cyclohexane and nitromethane in the picture on the right. Instead of bringing the 3-dimensional representations of the molecules into contact, COSMO-RS models assume that the probability of contact of two surface segments is only governed by the size of energy missfit. This greatly simplifies the calculation as only the shielding charge density distribution (s-profile) has to be considered. The required s-profiles were derived using the program package Gaussian using the B3LYP DFT functional and the 6-311G(d,p) basis set and are delivered as a separate databank (s-Profile Data Bank). Quantumchemical calculations are especially tedious in case of large molecules. To provide a reliable alternative, the program package DDBSP-ARTIST allows to estimate the required s-profiles via group contribution. For the use with COSMO-RS type models like e.g. COSMO-RS, COSMO-SAC and COSMO-RS(Ol), a large data bank with the required sigma profiles has been prepared. As the quantumchemical calculations become very demanding for large molecules, group contribution methods have been developed to predict sigma profiles. These complimentary methods are delivered with DDBSP-Artist and lead to reliable results for not too complex or multifunctional structures. 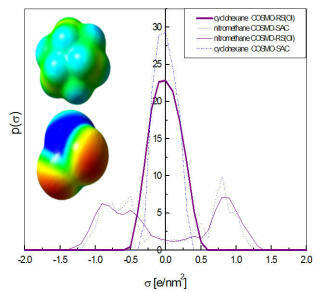 Sigma profiles from DDB-Sigma can be used within the DDBSP software (DDBSP Mixture Predict Add-On) and in most third party software (in COSMOTherm® a specially optimized parametrization for these profiles is available).